A collaboration between Canadian naval architect Robert Allan Limited (RAL) and tech specialist Kongsberg Maritime has boosted the former group’s plans for the development of a crew-free, remote-controlled fireboat. 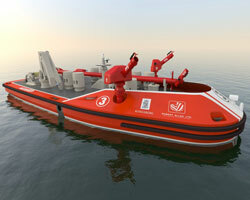 RAL had previously hinted at the possibility of an unmanned firefighting vessel, capable of sparing human crew the level of risk associated with tackling blazes at ports, marinas or aboard other vessels, with proposals for its RAmora 2400, or Tele-Operated Workboat or Tug (TOWBoT), concept (see Ship & Boat International March/April 2016, pages 31-33 and March/April 2017, pages 10-12). In principle, a remotely piloted vessel would enable first responders to send the boat into the thick of the action – for instance, a site affected by fire or a suspected/confirmed CBRN attack – to neutralise the threat, before dispatching personnel to the scene. This approach would also safeguard against the risks of toxic smoke inhalation and unexpected explosions. Now, RAL has come up with what it calls the RALamander 2000: a 20m fireboat equipped with FiFi 1 capability, and connected to either a manned fireboat or shore-based control room via Kongsberg’s high-bandwidth, wireless control and communications system. Kongsberg claims that this system’s “versatile architecture” will “leave the door open to a range of autonomy levels”, in line with RAL’s originally stated plans for a potential autonomous firefighting craft. Additionally, Kongsberg explains, the system will offer “auto functions”, including dynamic positioning, water spray target holding and line protection – “where the RALamander automatically moves back and forth along a line while directing protective spray cover on shore structures or vessels”. The RALamander 2000 will be equipped with three fire monitors, positioned on a retractable and height-adjustable mast. These will enable the vessel to throw a combined 2,400m³ (2.4 million litres) of water per hour (with optional foam). The vessel has been designed with a low profile, making it suitable for deployment in areas with low bridges, and to combat under-wharf/-marine fires. The vessel will also be fitted with a Grapnel Emergency Towing (GET) system, so that it can tow burning vessels away from the port and out of harm’s way.